My husband thinks I’m impetuous. I swiftly smack that thought in the arm. I am…passionate. I fall in love with an idea and then research it, mull it over, bathe in it until I become obsessed. And then, when I am so enamored that I don’t know what to do with myself, I present a full-fledged, new-to-you-but-not-to-me idea to my husband and we get to work. So it was with the goats. 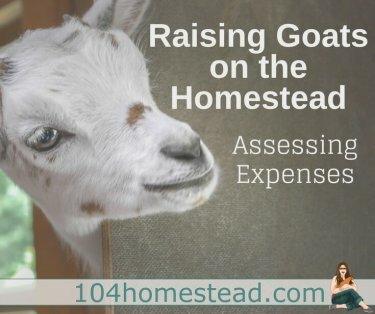 After researching breeds, assessing the costs, reading a slew of books – including Storey’s Guide to Raising Dairy Goats and Deborah Niemann’s Raising Goats Naturally – and spending hours on the incomparable Fias Co Farm blog. I decided to raise Nigerian Dwarf goats. They are compact, adorable, and their high butterfat content is rumored to make the best cheese. Sold! Our family took an introductory trip to Lil Bleats Farm and that’s all it took for my husband to be hooked as well. No man can resist the site of his boys climbing towers of hay and chasing livestock.It awakens something in their suppressed pioneer DNA and results in the building of fences and the raising of a goat shed. Really, you should try it. Once the fences were up, we brought two of our three goats home. Tess, the two-month-old doeling who would immediately steal our hearts and show us the weak spots in the fence, and Lucy, a shy junior doe on her second kidding who would teach us patience and the true meaning of crying over spilled milk. We are currently waiting for Ella, a yearling, to be successfully bred. 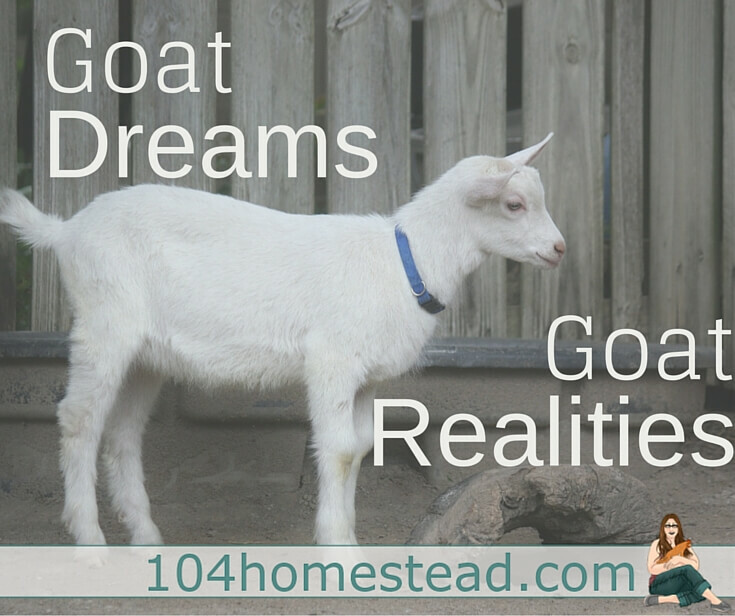 Before the goats came home, I dreamt of what it would be like. I read blogs – now selectively, I realize – of rookies like me sitting next to does that contentedly munch their grain while the homesteader leans a companionable shoulder into the little lady and daydreams as the milk pail fills. One day, I hope to write that blog. That day is not today. First, we started milking Lucy without a milk stand. I’ll skip the theatrics, which you can read here, but suffice it to say, what could have been merely awkward became fairly impossible. Poor Lucy and her grossly inexperienced new owners! We were making a hack job of this, and the amount of milk we took in was abysmal. Not only was there not enough to make goat cheese, but we barely brought in enough to use in our coffee. Then the milk stanchion arrived and I assumed our troubles would be over. I believe I expected a magic stanchion. No such luck. In reality, Lucy wasn’t used to being a family milk goat, our hands were not accustomed to the twice-daily strain of milking teeny tiny goat teats, and we were all still terrible at this. We had to hobble Lucy’s back legs with an old dog leash and milk as fast as we could – no time for finger cramping! – to get the milk pail sort of full before she decided to kick it over or step in it. The day we realized that a raised head was the precursor to a back leg kick and were able to save the milk…well, that was a banner day at Pare Down. And how is the milk? In a word, exquisite. I read somewhere that Nigerian Dwarf milk is the espresso of goat milk and I get that, both in terms of quantity and quality. Initially we were barely milking 6 ounces a day. And those 6 ounces took approximately 10 minutes an ounce to get from the goat to the pail. But after a week, we were up to 9 ounces. And after two weeks we were getting 15 ounces a day. And during week three we broke that one-pound goal with two 6-minute sessions and we were well on our way. Milking still isn’t easy. Milking often remains a 2-man job, with Gabe and I trading off between the roles of milkmaid and goat whisperer. We’ve had to scalp concert tickets and break plans for previously scheduled dinners out because we are now tied to the house for twice-daily milkings. The goats are sometimes unbearably loud, they poop an inordinate amount, and they have definitely added to the daily workload. I am often reminded by Gabe, new skills are not won easily; they have to be earned. So each day we learn a little more, it gets a little easier, and the rewards start to outweigh the extra work. Somehow, through the grace of time and effort, we all seem to be getting used to each other. By Lucy’s third kidding, her udder and constitution should reach their full dairy capacity. In the meantime we’ll continue to celebrate the smaller milestones. Little Tess now follows us around with the adoration of a puppy and Lucy has finally succumbed to the thrill of being petted, scratched and loved. It is week six, and Lucy is giving us just over 20 ounces of milk a day. Three days ago we started milking without the hobble and it’s (mostly) working. I have a quart of milk on hand and will attempt that mesmerizing Mexican caramel sauce, cajeta, this very afternoon. And once, for a grand total of 90 seconds, I was able to rest the bucket on the stand and milk with both hands in tandem just like a pro would do. Oh yes, I foresee an idyllic goat blog post of my own in the future. P.S. The cajeta was life changing. Seriously. So, so good. Danielle is the author of Pare Down, Look Up. She lives on 5 acres in central Colorado with her husband, two boys, two dogs, two cats, five goats, twelve chickens, thousands of bees and a whole lot of deer and wild rabbits who consider the Pare Down garden to be their private farmer’s market. Love the story. We are the proud owners of 3 Nigerian Dwarf goats. Beginners when we brought them home as well. Our milking Doe has been providing milk for two years now. She has only kidded once and we get appx 20 to 24 oz per day. She is healthy and happy, however we are getting ready to dry her off. we have been milking for so long we’re not sure what we are going to do with the free time. Perhaps plan a vacation! Thanks for a great post. Can you elaborate a bit more on the ‘unbearably loud’ part, the whens whys and hows, and what, if anything, in an ideal world, do you think would help keep the noise down? Liz — the goats are only really loud when they hay is empty, or the water trough, or we’re doing something they don’t like…like wrestling the boys onto the milk stand to trim their hooves. The majority of the time, they are angels. Darling post! We tried Nigerian Dwarf but their tears were just too small and was actually harder for me to milk. Switched to the large Alpine breed and it’s a breeze. We keep our Nigerian as a pet becuz although I retired her( ..So many babies) , she’ll always be a sweetie. Live their disposition and personalities. Oooh, goat cheese pizza. Why did this never occur to me. Yum! I think we went through similar experiences with our cow (and other animals like guinea fowl). I like what you said about skills being hard won, sometimes I expect things to be easy, but it takes time to get good at homesteading, especially if you didn’t grow up around animals and farming (I didn’t). Thanks for sharing your experience! Fellow milk maid here! Just wanted to put it out there, that toy can milk once a day without a terrible drop in production! Milling in the mornings has saved us on my boy’s game days, and evening time with the hubby. What a beautiful little goat (Ella?). This is the breed I’m set on too! After 4 years of hinting and telling him how great all that milk & cheese would be, the old man wants goats now too LOL. Gee, only 4 years. Is it based on a certain time or can you choose. ? Hi Amy – Lucy wasn’t used to being milked, so we set a schedule that was convenient for us, and close to the standard of 12 hours between morning and evening milkings. Right now, we milk her at 8 am and 7:30 pm and she has no issues with that timing. If she had been milked by her previous owner at a different schedule that I wanted to adjust, I would have done it in small increments so as not to cause her any discomfort. 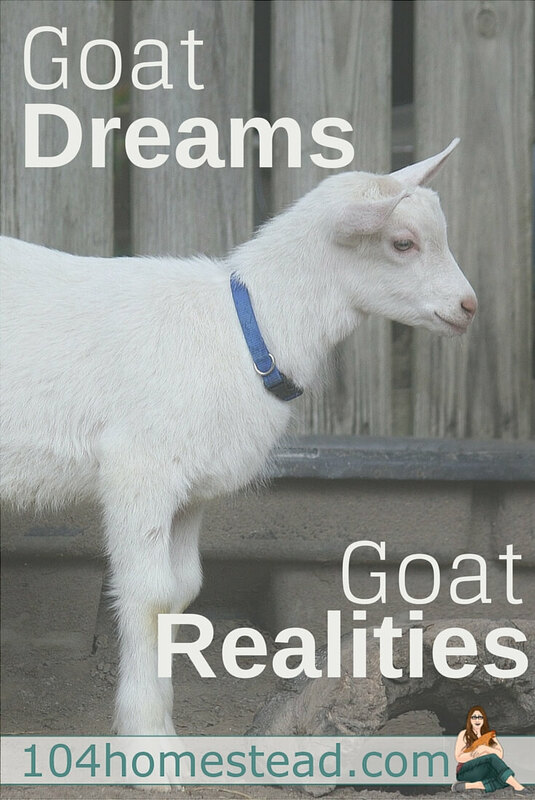 thank you so much for this incite into the real realities of owning goats, it seems most people just gloss over things and its not until you see first hand how things really are.